We again have President Donald Trump to thank/blame for our latest, greatest meme. 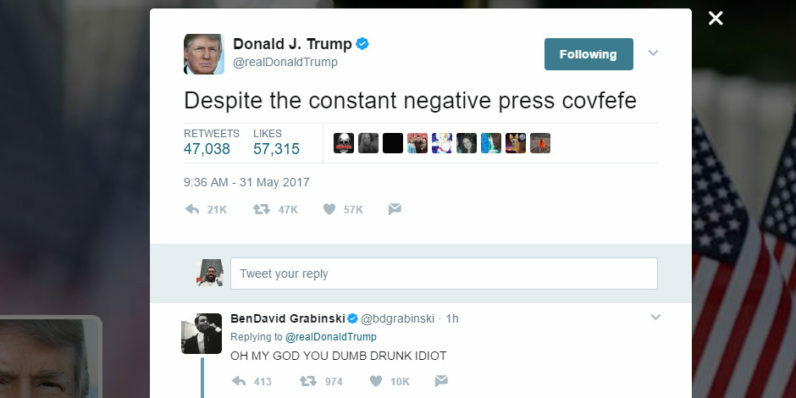 Thanks to him, the internet spent a day losing its collective mind over covfefe. Everyone waited for him to delete the tweet and finish his thought. And waited. And checked their watches. The tweet stayed up a total of six hours. And in the interim, the internet had a field day. Urban Dictionary quickly hit upon the most-likely definition of the word: “When you want to say “coverage” but your hands are too small to hit all the letters on your keyboard.” Senator Al Franken says it’s a Yiddish term for “I gotta go to bed now.” Huffington Post wrote a breathlessly satirical article about the meaning of “covfefe” in the native Samoan language (hint: it doesn’t have one). Ah, the small group explanation. You don’t have a high enough classification to know what covfefe means. STAND DOWN WIZARD. THE ORB IS MINE FOR THE TAKING. BE OFF WITH YOU SO THAT I MAY ASK THE ORB MASTER WHAT HE REQUIRES OF ME.